Pinotage is the mother lode of a modern day California gold rush for Loma Prieta Winery with their first Pinotage release. 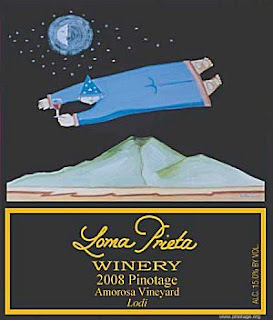 So far this year the Loma Prieta 2008 'Amorosa Vineyard' Pinotage has won Double Gold at the Florida State Fair International Wine Competition, and Gold at the Hilton Head Island Wine & Food Festival in South Carolina, plus Gold at the prestigious San Francisico Chronicle Wine Competition, the worlds largest competition of American wines. "by knowing the owner and winemaker of Vino Con Brio in Lodi, CA. I liked the wine so much that I got one ton in 2008 and five tons in 2009. This year I will probably do close to 20 tons which may make my winery the largest producer in the USA. I have already grafted over 500 vines to Pinotage and will plant another 500 bench grafts." "It has the soft fruit and perfumed flavors of pinot noir and the backbone and earthy, spicy notes of a syrah or cabernet sauvignon. If pinot noir is described as a feminine wine and cabernet sauvignon as a masculine wine (yes, these are lame gender stereotypes; female soft, male brawny), then Kemp’s pinotage exhibits traits of both. It’s got yin and yang going on in equal measure. In spite of its relatively high 15 percent alcohol content, pinotage is not the fat fruit grenade you might expect. Yes, it’s a big wine loaded with juicy, round grape and blueberry flavors, but the acid and tannins balance and tame what could otherwise be a sloppy, lip-gloss-covered kiss of a wine. As pinotage decants in the glass, it seems to get a little leaner and racier. That lively acidity makes pinotage great with food, too. Unlike South African pinotage, Kemp’s wine lacks the telltale banana flavor. He says he didn’t like the few South African pinotages he tried. He is out to make a California pinotage." The image used for the label was painted for Loma Prieta by New Orleans artist Martin LaBorde. The rolling green mountains in the background depict the view of Mt. Loma Prieta as seen from the Loma Prieta Winery. The yellow, red, and orange running beneath the mountains represent the famous 1989 Loma Prieta earthquake. The flying wine connoisseur in the painting is a recurring character in Martin LaBorde's work, a little magician named Bodo. Welcome to the Pinotage Family, Loma Prieta.